This Highlands NC home for sale is located at 151 Holt Circle. This walk-to-town home is perfect for a full time residence or a mountain getaway. The home boasts 3 bedrooms and three baths, and has an extra room that is currently being used as a 4th bedroom. 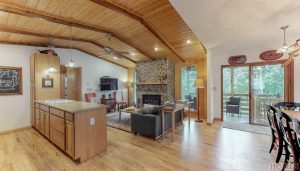 This wonderful, cozy home is a must on your list of Highlands NC properties to view! This Highlands NC home has two levels. The main floor boasts an open floor plan which is warm and inviting. The great room is fabulous, with vaulted ceilings and a fabulous floor-to-ceiling stone fireplace. The kitchen has granite counters and opens to all of the activity. Also on the main floor are two of the bedrooms and two of the bathrooms. The third bedroom and bathroom are on the lower level. There is a partially covered upper deck on the upper level and a smaller screen in porch on the lower level. The neighborhood is great. If you are looking to live in town this home is the one for you! Schedule a towing of this Highlands NC home for sale today! Contact me, Lynn Kimball, today to schedule a private showing of 151 Holt Circle. I welcome to help you complete a successful Highlands NC property search. Let my knowledge and experience serve as your guide. If this Highlands NC home does not suit your needs I will find you one that does!